New Line Clothings Limited IPO shares has been credited into respective Share Holder’s BO accounts on 15 April 2019. Share holders are advised to check updated balance with their respective DPs, Source: CDBL. New Line Clothings Limited IPO Lottery Result published on 24 March 2019 & found here. New Line Clothing Limited Subscription Open from February 18, 2019, and Close on February 28, 2019. New Line Clothing Limited IPO Lottery Result updated. 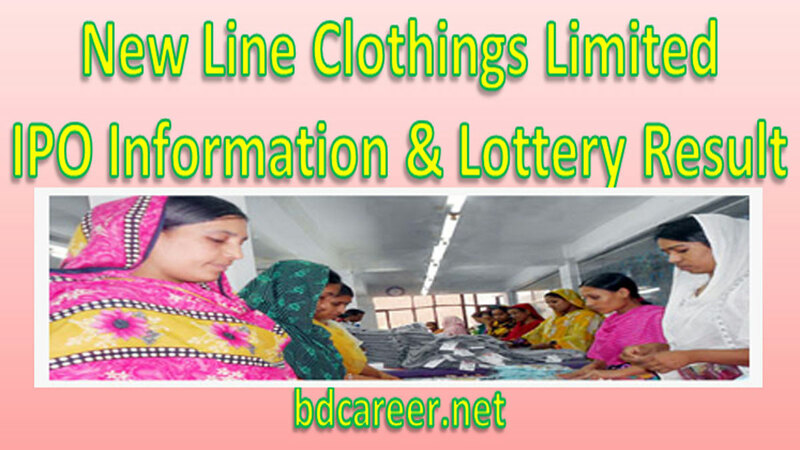 Download New Line Clothing Limited IPO Lottery Result that will be published & found here. IPO or an Initial Public Offer (IPO) is the first sale of a stock by a private company to the public company. In this way, a company can increase money by issuing either debt or equity. IPO or Share market inauguration is a type of public offer in which shares of a company generally are sold to the predictable investors that in turn, sell to the general public by a securities exchange for the first time. New Line Clothing Limited IPO Lottery Result & Information found here. Bangladesh Securities and Exchange Commission (BSEC) has approved the initial public offering (IPO) of New Line Clothing Limited on 27 November 2018 at their 667 no. board meeting. A BSEC meeting, presided over by its chairman M Khairul Hossain, approved the IPO proposal of New Line Clothing Limited, said a BSEC press release. BSEC approved the IPO of the company to raise capital of Tk 30 crore from the market by offering 3 crore shares at a price of Tk. 10 each share under the Fixed Price method. According to the Financial Statement The company’s earnings per share (EPS) was Tk 1.90 and the net asset value (NAV) per share Tk 33.46 at the end of June 30, 2018. Banco Finance and Investment Limited, Shandhani Life Finance Limited and Southeast Bank Capital Services Limited have acted on behalf of the company’s issue manager. The company’s IPO fund will be used for pay bank loans, purchasing capital machinery, expand factory and meeting IPO expenses & IPO related other relevant expenses according to the IPO prospectus. 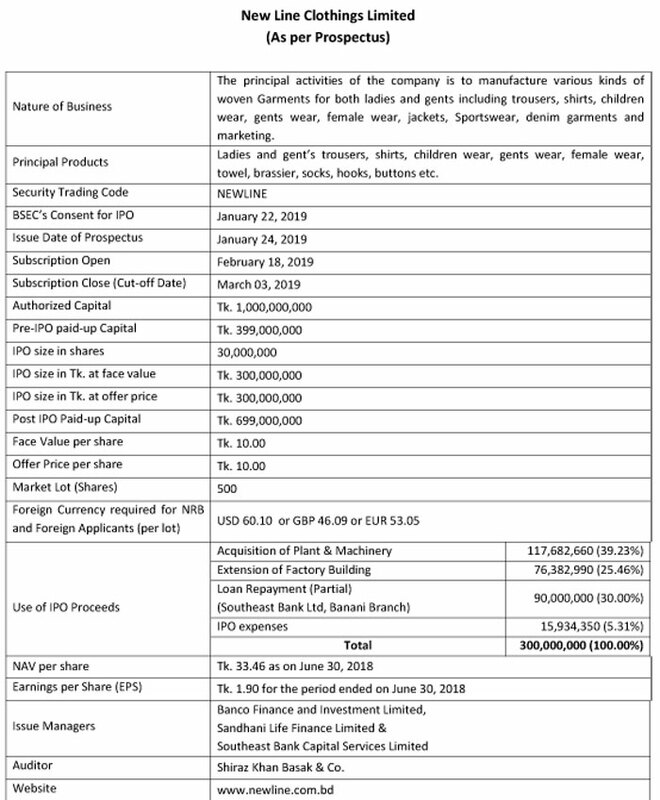 New Line Clothing Limited IPO Lottery Result 2019 published on 24 March 2019 & found here. Download New Line Clothing Limited IPO Lottery Result from here. After ending of application of Initial Public Offer (IPO) from 18 February to 28 February 2019. New Line Clothing Limited IPO Lottery draw will be held on 24 March 2019. Place: Engineering Institute, IEB Millaniton, Ramna Dhaka at 10:30 A.M. The IPO results will be published on the websites of Dhaka Stock Exchange (DSE), Chittagong Stock Exchange (CSE) and the company’s website after the lottery programmed. See the Result below. Presently, 53 textiles and garment companies are listed with the Dhaka Stock Exchange (DSE), accounting for about 4 per cent of total market capitalization of the DSE. The Company was incorporated in 23 May 2000 as a private limited Company and was subsequently converted into a public limited company on June 04, 2013. New Line Clothing Limited is 100% export sloping Company. It has started its commercial production on March 01, 2007. The Company has been germinating strongly to its blooming stage till date with 20 line Japanese brand sewing machine producing about 10 million pieces of trousers and jackets of different items per year. With a state-of-the art infrastructural astonishment of existing 5 floors with total area of 180,000 square feet. It has already proudly heralded its presence in the potential markets of Germany, UK and Australia with an annual turnover of USD 30 million per annum. New Line Clothings Limited offers complete apparel sourcing and thereby allowing us to offer an expansive array of products, taking advantage of strengths, skills and price advantages offered by each country. The Bangladesh Securities and Exchange Commission (BSEC) has approved the initial publication of New Line Clothing Limited (IPO) for withdrawing money from the stock exchange. This approval has been given in a regular meeting of the Commission. New Line Clothing Limited has been emerging as a conglomerate with knitting, fabric dyeing and finishing facilities under one roof since its commercial launch in it’s inception. The main activities of the company is to manufacture various type of woven garments for both ladies and gents including trousers, shirts, children wear, gents wear, female wear, jackets, Sportswear, denim garments and marketing. There is no subsidiaries of New Line Clothing Limited. The registered office & factory of the Company is located at its own premises at Plot No. 1945, Kauchuakuri, Kamrangachala, Mouchak, Kaliakair, Gazipur-1761, Bangladesh.